I like to believe that the average person is not mean and out there to hurt people’s feelings on purpose. 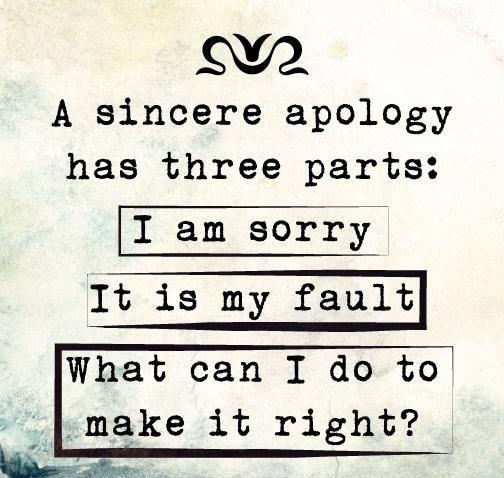 Having said this, I have observed that many people don’t really know how to apologize in a sincere way. That’s why they prefer not to apologize and they hope everyone will tolerate and/or forgive their misbehaviour. Many of us have a very strong sense of “right” and “wrong”. However, it is important to realize that what seems to be “right” for me, may not be “right” for you. Based on our upbringing, values and experience we have a different outlook on things and that’s o.k. In the manufacturing industry stress often gets in the way, and when we are stressed we become very different people. However, when you apologize and add a reason why you behaved the way you did, it takes away from the apology. In other words, say “I am sorry” and not “I am sorry but”…. Apologies don’t need a reason. It’s all about owning up to it, not matter what. It has been said that we should never ruin an apology with an excuse (true for our personal and professional life). Don’t allow your ego to get the best of you. Apologize from the heart and expect your apology to be accepted. Deal?